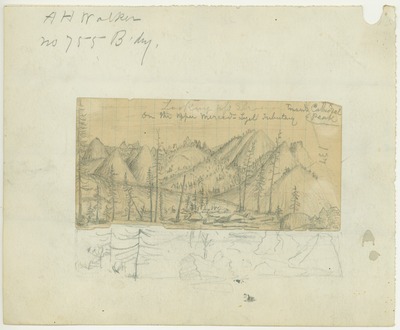 Note on verso: "Shows peculiar rock cones of granite polished by glaciers. Rosin in white sand 1st Merced laks. In 3rd Yosemite forest a few silver firs rise high out of the yellow Aspen grove like tall dark open thistles above a field of ripe wheat." Original drawing dimensions: 7 x 14.5 cm.